The noble deeds of King Arthur and his Knights of the Round Table have been told and retold for hundreds of years. These valiant heroes of legend went on many a glorious Quest, defending England from their seat at Camelot. With the aid of the wizard Merlin (that’s me!) and the power of the mighty sword Excalibur at their fore, these Knights sought the Holy Grail and worked tirelessly to turn back the forces of strife and evil in any form. Shadows Over Camelot is a cooperative game in which players take on the roles of King Arthur and his knights, going on various Quests to prove their mettle and valor before despair and darkness overrun the land. Using a hand of cards, players contribute to one of several ongoing missions, hoping to triumph over antagonistic forces lined up against them. Each triumph brings one or more White Swords to the Round Table, while each defeat brings one or more Black Swords. When the table is filled, there will be a reckoning, and unless the deeds of the heroic knights outnumber their failings, evil will prevail. In simple terms: the Knights need to ensure that at least seven White Swords land on the Round Table before seven Black Swords do. To say this is challenging is an understatement – player resources can feel limited, and there are always more things going on than the players can reasonably contend with. Each turn, a knight may only perform one Heroic Action, with the option of performing a second at the cost of a life point. Knights who run out of life points are dead and out of the game permanently. Meanwhile, at the start of every player’s turn, the forces of evil grow in power. Perhaps an invading army grows stronger, or the Black Knight at the tourney grounds increases in skill. Perhaps the Quest for the Holy Grail grows more challenging. Maybe a Knight loses a life point, or the forces besieging Camelot add more tools to their arsenal. Complicating the cooperative play is that resources can’t be exchanged between players – your cards are your cards, and you can’t give them away. Furthermore, while many quests afford multiple knights the ability to work together, some are solo quests that require a lone knight to prevail against a skilled foe. The invading Picts and Saxons must be fought off with a straight, 1-5 played in order; the Black Knight at the Tourney must be beaten with two pairs, played by a lone heroic Knight; Sir Lancelot will not let you pass unless a lone Knight can best him on the bridge with a full house; the sword Excalibur slips away toward a frozen land where it will be lost forever, and cards must be discarded to bring it back to shore; the Quest for Holy Grail requires seven Grail cards to be played as the forces of Despair constantly push back against the Knights; and lastly, the terrible Red Dragon threatens the realm, and while three sets of three-of-a-kind may drive it back temporarily, it shall return. Fortunately, your Knights are all heroes of distinction, each with their own special talent. King Arthur can trade one card with another player on his turn; wise Percival can foresee dark events; bold Tristan can venture forth and take action on the same turn; valiant Galahad can play an additional card on his turn, and so forth. However, all must beware, for there may be a traitor in your ranks, secretly working for the forces of evil to undermine Camelot and see it all burn. The uncertainty created by the mere possibility of a traitor being present in the game causes a lot of suspicion, though it has to be said that with as much constant strife as the game is already capable of throwing your way, the traitor’s reveal can stoke frustrations in a big way. A well-played traitor can steal valuable artifacts, sow discord, and secretly cause quests to unravel and fail. Certain knightly powers become horrid when they fall into the hands of a traitor – a treacherous Gawain may stockpile necessary cards to keep them away from the loyal knights, for instance. 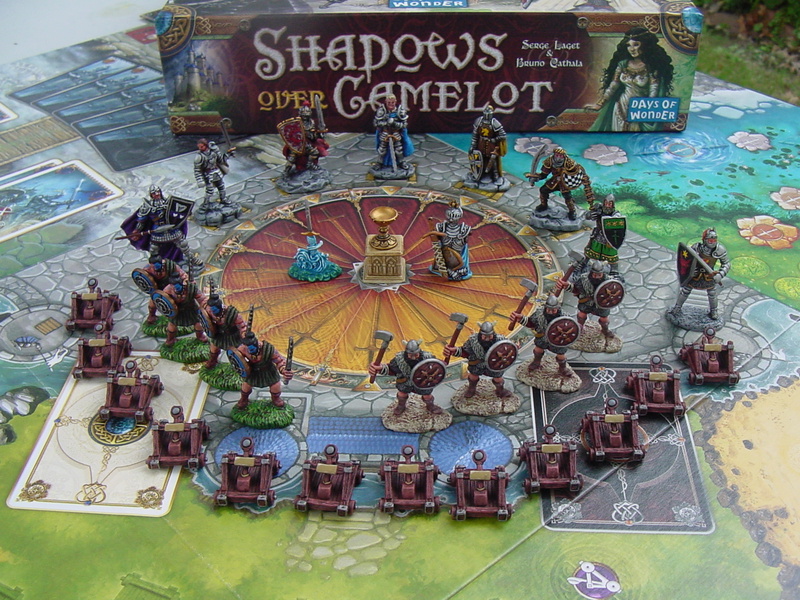 Shadows Over Camelot exists in a weird place where it’s a cooperative game that doesn’t feel cooperative in the conventional sense – it feels moreso like every player is contributing to a general goal by going off and doing things on their own. Things come together a bit more in the late game when there’s a push to complete higher-scoring quests that require multiple contributors, but if Evil has spread itself well enough, events will naturally force the Knights to react to them. Certain Black cards can cause absolute havoc and unravel multiple goals at once, and the prospect of permanent character death eliminating a player threatens to undermine the group’s chances for victory. I’m still not sure how I feel about player elimination in a co-operative game of this length; I haven’t yet seen it happen except in the last few minutes, but I can imagine a scenario in which someone gets dropped from a game very early on, and that’s never fun. On the whole, though, Shadows Over Camelot is an engaging and richly-illustrated game dripping with theme. With a seven-player cap, it’s also much more amenable to large groups than most others in the genre, which is really appreciated. It’s also a bit longer, and there’s a lot going on on the multiple boards, but the game is actually significantly less complex than it may look at first blush. One minor quibble is the dual rulebooks, which I don’t find to be laid out in a convenient manner – I would have appreciated an index on the back cover to tell me where specific rules might be found. Nonetheless, production values are high – not just artwork but also plastic miniatures (color-coded for the knights) and color-coded dice for life tracking. Saddle up thy noble steed and ride forth to smite the forces of Mordred and Morgan Le Fay, brave champions of the realm! Camelot could use heroes like you!